The three Furies in Greek mythology. 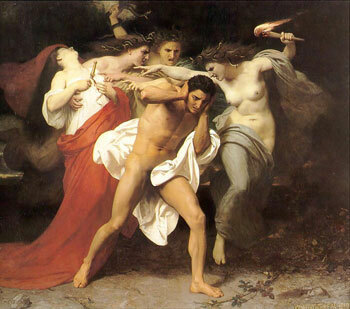 The Erinnyes (also spelled Erinyes) were “the Angry Ones”, known as the Furies in Roman. They were the feared avenging goddesses in Greek and Roman mythology who were born from the falling drops of blood of Uranus (Sky) when he was mutilated by his son, the Titan Cronus. The drops fell on Mother Earth (Gaea) and impregnated her. Other versions of their birth claim that they were the daughters of Mother Earth and Darkness, or of Nyx (Night), or the Titans Cronus and Eurynome (and thus sisters to the Moerae, the Fates). One of their famous victims, Orestes, gave them the name ‘Eumenides’, the ‘Solemn Ones’, or ‘Kindly Ones’. More on Orestes below. Their home was at the entrance to Tartarus, that infernal place deep in the Underworld where the souls of the condemned were exiled, a gloomy place in Hades as far distant from earth as earth is distant from the sky. Others call their home Erebus, the darkest pit of the Underworld. There, the Erinnyes would screen out those unfortunate doomed who had yet to atone for their sins, relentlessly tormenting them. No prayer, no sacrifice, and no tears could move them, or protect the hapless object of their persecution; and if ever they felt that the criminal would escape them, they called in the assistance of the goddess Dike (Justice). The Erinnyes were closely connected to Dike, for the merciless maintenance of strict justice was their utmost concern. What did they look like? Often they were depicted as repulsive winged female creatures wearing black robes. Other descriptions adorned them with snakes twined in their hair, piercing red eyes dripping blood, pitch-black bodies with bat wings, and even sporting the heads of dogs. In works of art and on the stage, however, their fearful appearance was greatly softened down, and they were represented as solemn and purposeful maidens, wearing the richly adorned attire of huntresses, with a band of serpents around their heads, and serpents or torches in their hands. Because nobody really wanted anything to do with these avenging creatures, mortals rarely referred to the Erinnyes by name, in case they invoked their wrath. Instead they were often euphemistically called the aforementioned Eumenides, the ‘Kindly Ones’ or ‘Solemn Ones’, the term coined by their hapless victim called Orestes. There were usually said to be three Furies (note: At Athens there were statues of only two), called Alecto, Tisiphone and Megaera, but quite often they were depicted as a large flock of flying creatures, with the three named members leading the avenging pack. The Harpies, who were filthy, monstrous, vulture-like female beasts loathed by humans, often served the Erinnyes in capturing or tormenting those unfortunate people who had displeased them. Portrayed with and without wings, the Erinnyes in time became better known as those responsible for avenging offenses by children against their mothers, and eventually came to be the divine punishers – along with Zeus – of anyone who committed perjury or patricide (killing of one’s father). As their influence spread, the Erinnyes became the personification of the concepts of vindictiveness and retribution (also see Nemesis), and represented the psychological torments associated with a guilty conscience. Eventually their influence extended to the hearing of complaints of insolence by the young toward the old; punishing disrespect of parents by their children; as well as lack of hospitality to guests by their hosts, a terrific breach of ancient etiquette.